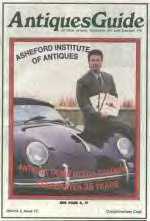 the course over a period of four years, introducing it as the Asheford Institute of Antiques in 1966. Asheford Institute of Antiques attracts a broad range of students with diverse interests. Susan Close, for example, is a graduate from Ontario, Canada. She first became interested in antiques as a child growing up in England. She wanted to combine her interest with her residence in a resort area which offered a good location for an antiques business. Close feels she got just what she needed: a complete history of periods and styles, information about manufacturing techniques and materials used in the various periods, information about restoration, how to identify fakes, and a fully developed profit plan to help her execute her business set-up and strategy. Her business is booming and she still refers to her course materials and uses the Institute's Research services when she has questions. As a construction laborer, Jason Felosky's rugged build may have hidden his aesthetic interest in antique furniture. He describes himself as always being drawn to the history and appearance of antiques. He wanted to know more about how they were made and by whom. Dan Hoffman, Director of The Nepean Museum of Nepean, Ontario, remembers his early years in Germany. His father was stationed overseas in the military. Every weekend, he loaded the family in the car and took them on tours of museums and historic sites. Hoffman credits these early experiences as the basis for his interest in history and antiques. The Asheford course gave him "a broader base of understanding how and why things came to be designed as they were... it gives you a greater understanding of history." Hoffman finds this information very beneficial in his role as a museum director. While his position in the public trust prevents him from being involved in the antiques business, he says that for his own personal pleasure can now "spot a bargain at a 100 yards." Louis Zadnichek worked for 20 years on the Mobile, Alabama waterfront in ship breaking and chandlery. During those years, he was a serious collector of nautical and railroad artifacts. When he retired from the waterfront, he wanted to make the transition from collector to dealer. Zadnichek took the AlA course and now owns and operates Black Dog Gallery in Fairhope, Alabama, specializing in railroad and marine artifacts. He publishes a catalog on a regular basis and deals with an international clientele by mail order. Zadnichek credits the Asheford program for "making the gallery not only possible, but a success as well."